When the Pixel launched in the UK in late 2016, Apple and Samsung dominated the premium smartphone market. With every brand promoting features that became irrelevant almost as soon as they hit the market, Google’s challenge was to build a desire for consumers in a fatigued category. A third of iPhone users are “unsatisfied.” Most keep buying the newest iPhone, settling for evolution, despite Apple's promise of the revolution. The Pixel 2 offered the best camera in the world, but through research, Google found its differentiation was Google itself. It determined that it wouldn't just talk about its excellent camera, but would celebrate its authenticity by shining the spotlight on trendsetters who reflect Google's philosophy. The brand scoured the world of fashion to find 10 “creatures of change" and briefed them on the new Pixel 2. These influencers gave Google a peek behind the style curtain over 10 days: their inspiration, staying connected, trends they spotted, and more. 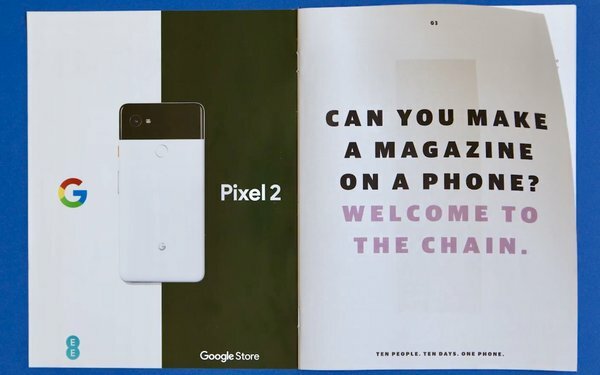 All content was captured with the Pixel 2, uploaded daily into The Guardian, and curated into over 50 digital articles, videos, and a 32-page glossy magazine, The Chain, for distribution across London. Purchase intent went up 40%. Unaided awareness of the Pixel 2 doubled. Create a new platform around your product. Enlist fashion influencers to help tell your story. Partner with media to gain mass exposure. Leverage your unique selling proposition. This won the Print category in MediaPost’s 2018 Creative Media Awards.